Are you looking for a great camera having an APS-C-size sensor? The best, most-portable APS-C camera can capture quick sports action and subjects in dim light with fast autofocus: Sony Alpha A6300 camera (buy at Amazon with 16-50mm lens) (2016, 14 oz body + 4 oz 24-75mm equiv zoom). 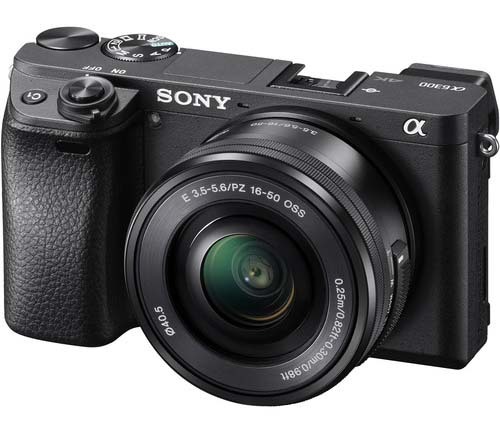 Or save hundreds of dollars on earlier Sony A6000 (2014, 12 oz body), nearly as capable. Sony 10-18mm f4 OSS E-mount lens (8 oz, SEL1018, 2012) captures exceptionally crisp wide angles for architecture & landscapes at 15-27mm equivalent (mostly wider than the 24mm equivalent of RX10 III, though you can easily stitch images to compensate). Sony E-mount 16-70mm F4 Vario-Tessar T ZA OSS SEL1670Z lens (2013, 11 oz) clearly beats Sony’s 16-50mm kit lens, but costs $600 more! SEL1670Z lens is sharpest around f/5.6 across its range. However, my June 2016 field tests surprisingly revealed that a SEL1670Z mounted on A6300 is only slightly better than the new Sony RX10 III camera in bright light at wider angles up to 3x zoom, but is equally sharp in dim light and at 4x in any light. RX10 III’s remarkable performance in dim light is probably explained by its efficient BSI sensor design, plus its larger diameter lens of 72mm (versus just 55mm filter size on SEL1670Z), gathering more light. Details: In side-by-side tests at optimal apertures (one stop down from brightest), from about 16-50mm (24-75mm equivalent) in direct sunlight, and for closest focus in dim light around 45mm equivalent, SEL1670Z on A6300 can resolve enough extra detail to make about 5% wider/taller prints than Sony RX10 III, but otherwise not. From 75-105mm equivalent in most lighting situations, or in dim indoor light across its range, SEL1670Z is equaled or beaten by RX10 III in half of my hand-held shots at optimally-sharp apertures. 11x zoom Sony 18-200mm OSS E-mount SEL18200 silver lens (18.5 oz, 27-300mm equiv) mostly tests worse than RX10 III (read my review). 11x zoom smaller black SEL18200LE lens (16 oz) captures fuzzier images than SEL18200. Sony FE 24-70 mm F2.8 GM SEL2470GM lens (2016, 31 oz) is brighter than the F3.2-4 of RX10 III at this 36-105mm equivalent zoom range on A6300. Sony FE 70-300mm F4.5-5.6 G OSS SEL70300G lens (2016, 30 oz) reportedly grabs good sports & wildlife shots on A6300. But within this range from 105-450mm equivalent, I suspect that the significantly faster F4 of RX10 III rivals the image quality of SEL70300G lens when tested side by side. RX10 is a better value and more portable for travel. Sony FE 70-200mm F2.8 GM OSS SEL70200GM (2016, 52 oz) has bright, premium glass, advantageous for dim light photography, a full stop faster than RX10 III (which is F4 within this 105-300mm equivalent range). Has anyone compared this side-by-side with RX10 III in the field? — please “Leave a Reply” at bottom. Sony FE 70-200mm F4 G OSS SEL70200G lens (2014, 30 oz) has premium glass, but is no brighter than the F4 of RX10 III within this 105-300mm equivalent range. Sony FE series lenses support Sony A7 series full-frame cameras, and also APS-C-sensor E-mount cameras (A6300, A6000 and earlier NEX-6 & NEX-7). Clearly, Sony’s A6300 & A6000 are now outgunned for outdoor travel photographers, as Sony Cyber-shot DSC-RX10 III camera (buy at Amazon) packs the ultimate all-in-one travel tool into just 37 ounces. The RX10’s weather-sealed, bright f/2.4-4 lens (72mm filter diameter) with remarkable 25x zoom is sharp across the frame from 24-600mm equivalent, well into birding territory (read my Telephoto article). With the latest 1”-Type stacked BSI sensor, RX10 captures great depth-of-field details, everywhere from close flower shots to distant bird feathers. In my testing, RX10 III clearly beats the 11x SEL18200 lens (62mm filter diameter) on flagship APS-C Sony A6300 anywhere above 90mm+ equivalent telephoto, even as high as ISO 6400, due to the faster lens and BSI technology compensating for sensor size difference. At wider angles, 27-80mm equivalent, they capture similar quality in bright outdoor light — but in dim or indoor light, A6300’s larger sensor can sometimes resolve more detail on SEL18200. The sharper zoom SEL1670Z is only about 5% better than RX10 in bright light, and no better in dim light. Conclusion: Among APS-C sensor cameras, Sony A6300 is my pick for top quality and best value; but now the Sony RX10 III with a smaller 1-inch-Type BSI sensor, combined with superb 25x lens, is a much better value than APS-C for travel, sports or wildlife photography. To gain up to about 5% in real resolution over RX10 III, the Sony A6000/A6300/A6500 cameras require interchanging only the brightest, highest-quality lenses (such as pricey f/2.8 lenses, Sony FE 24-70mm or FE 70-200mm). Lesser-quality lenses on APS-C are now antiquated by the all-in-one Sony RX10 III camera. 425 phase-detection autofocus (AF) points across the sensor (versus 179 in A6000). These cameras use a hybrid of on-sensor phase detection (for depth awareness) and contrast detection autofocus (for high precision). Big viewfinder OLED 2.36 million dots with optional 120 fps refresh (versus 1.44 million in A6000). Battery life increased to 400 shots, or 350 with EVF (versus 360 shots, or 310 with EVF in A6000). A6300 is one of the top APS-C cameras at high ISO: A6300 improves ISO 1600 clarity by about a half stop, ISO 3200 by a full stop less noise compared to A6000. A6300 introduces UHD 4K video (3840 x 2160 pixels at 30p). With Samsung apparently orphaning its NX1, the A6300’s video abilities are only rivaled by Panasonic GX and GH models. Body is now magnesium alloy, environmentally sealed. 14-bit raw format introduced (when using mechanical shutter) versus 12-bit raw in A6000. All these improvements in the A6300 come in a slightly heavier 14.3-ounce body weight (with battery & card; versus A6000’s 12.1 oz), still significantly lighter-weight than most DSLR-style cameras. If you don’t need a viewfinder, a cheaper Sony A5100 adds touchscreen and includes A6000’s hybrid autofocus system. Read about A6300’s predecessors and more lens analyses: Sony A6000 & NEX top Nikon for travel, 11x lens. Hi, I have no doubt your tests and results are accurate, and as an all in one, the RX10 iii is a great solution for travel. But when you really want those low light shots, fast primes on the A6300 blow the RX10 away (I have the RX100 and A6300). Sony desperately needs to produce good quality fast zooms for their APSC E mount cameras. They haven’t released a new lens for APSC in nearly 4 years! If they expect consumers to buy ridiculously expensive, large, and heavy full frame glass for the crop bodies, they are sorely mistaken. The A6300 is easily 1.5 stops better in low light than the 1 inch sensor. All it needs is fast glass. Thanks. Thanks for your question. Personally, I wouldn’t have any hesitation picking Sony RX10 III for sports (and also certainly for travel), instead of the Sony A6500 system which would require interchanging a pricier set of lenses. The only advantage of A6500 is being slightly sharper (possibly up to 5% bigger prints) at around 30-60mm equivalent focal lengths, but only when using a prime lens or Sony 16-70mm f4. Around 30-60mm equivalent, Sony 18-105/4 might make around 3% larger prints versus RX10 III, which is not very significant (as inferred from SLRGear.com testing showing SELP18105G performing similarly to my personally tested SEL18200). Note that Sony 70-300/4.5-5.6 lens is about a half to full stop slower than RX10 III, and also probably won’t autofocus significantly better, and likely won’t produce significantly sharper quality (though I haven’t tested that lens). For rapidly changing events such as sports, you often have no time for changing lenses, which is where RX10 III’s surprisingly sharp 25x zoom shines. RX10 III’s autofocus is sufficiently fast to accurately capture a huge range of subjects at any distance, especially good for auto-locking onto human eyes. In the RX10 III, Sony has created the best-ever all-in-one camera, without significantly compromising image quality or autofocus capabilities.